Recruiting volunteers, regardless the value of the cause, is a challenge with everyone in modern society so overextended. Lawyers to the Rescue is no exception. It takes strategic and clever campaigns to successfully bring new people ready to work into the organization. Here are seven tips for successful recruiting. Human beings tend to do those things that benefit them or their family and close circle of friends before tackling other endeavors. While there is plenty of altruistic spirit in the world, appealing to those things that people value and want in their lives will get the best response. First and foremost, understand why various groups might want to volunteer. Perhaps they want to give back to the community as thanks for their own success, or they have family in similar need. Or they need volunteer credits to graduate from high school. Whatever the motivation, be sure both your online and hard copy materials clearly articulate the benefits Lawyers to the Rescue brings to the volunteer. Law schools are a great source of volunteers at a variety of levels. Obviously, students are looking to network to advance their careers and have good experiences to put into their resumes, but don’t overlook the power of other groups such as alumni. And also include any pre-law majors at undergraduate institutions. Interacting with law school faculty is the first step to reaching students and alumni. Offer to do a workshop or guest lecture for a class, or to publish something about the school’s activities in your newsletter or on your website. Getting just one faculty member excited about the potential of a collaboration can grow into an extensive network of volunteers. 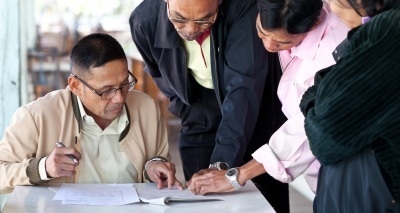 Caption: Law school faculty are a great resource for volunteers. Stuff a Volunteer with Pizza is a lot more fun-sounding event than the Envelope-Stuffing Work Session. Remember that while you take the cause very seriously, many volunteers are there for selfish reasons like making new friends. And that’s okay as long as you understand how to communicate effectively with them. Get creative with names that are fun and engaging to attract attention. No one wants to work with a stodgy group, and volunteers are especially looking for worthwhile uplifting activities. Caption: Many volunteers come in for the social aspect of work and special treats, like pizza parties! And speaking of pizza, don’t forget that volunteers love treats, especially food. Nothing draws volunteers in and at the same time says “thank you” like pizza, donuts, home-baked goodies or a cookout. Okay, fruit and healthy snacks work, too, as well as little gifts like tote bags. National Public Radio led the way with tote bags, which also are free advertising all around the community. While there is a small associated expense with thank you gifts, the cost is far less than hiring an employee. Some of the best recruiters are our own volunteers, who surely must have some family or friends they can rope into coming to just one event to volunteer on a one-time basis. Then hopefully they have so much fun and like the group so much, they sign up for more. In the worst case, you have an extra volunteer for an event. Posting requests for big jobs like editing a newsletter will immediately deter new volunteers. Start out asking for help with a task that is simple and easily finished in a short period of time. People fear large time commitments but are often willing to do something that fits easily into their schedule. The volunteers who become integrated into the group will then rise to the occasion when you need help with a bigger project. Many organizations make the mistake of using social media platforms, especially Twitter and Facebook, as only a place to post information or pleas for help. This is a recipe for failure in reaching the young, hip, energetic crowd that makes the best volunteer source. Social media is all about interaction. Remember, it’s social, which means you should be chatting like you do with a friend or colleague, not holding up a print ad for them to read. The dialogue can be professional, but it should have a personal slant. Asking questions is a great way to get a conversation started. Simple things like, “What was your undergrad major?” or “Do you speak a second language?” can lead into discussion of the types of legal aid needed or description of populations that need help who don’t speak English. While it takes a little more time to build relationships in cyberspace than to just post announcements, new “friends” are more willing to volunteer if they know you, even from afar. Then when you do post a volunteer recruitment plea, it won’t fall on deaf ears. And finally, to retain volunteers, don’t forget to say “Thank You!” Remember, these are people donating their time, energy, and expertise to your cause. You cannot say “Thank You” enough to this valuable resource! Sarah Boisvert is a seasoned writer who covers topics ranging from starting a non-profit to business management, travel to music, and the environment to new technologies. She has also written on problems with Ripoff Report, finding a cube 3D printer, and eco-tourism in Australia.